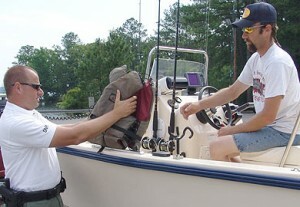 In an effort to keep state waterways safe during the upcoming Memorial Day holiday weekend, the S.C. Department of Natural Resources Law Enforcement Division will again be conducting courtesy safety inspections at some public boat landings. The Memorial Day holiday weekend is one of the busiest weekends of the year on state waters. DNR boating safety and enforcement officers will perform a quick, but thorough, inspection for items such as required safety equipment and proper boat and motor registration. Those who are not in compliance with safety regulations or registration requirements will not be ticketed during the complimentary inspections. Instead, they will be given an opportunity to correct the problem before they launch their boat. DNR officers will also be available to answer questions and give boaters tips on how to stay safe on the water. Conway Marina Landing-Waccamaw River-10 a.m. to 12 noon-Horry Co.
Riverfork Public Landing-Lake Greenwood-10 a.m. to 12 noon-Laurens Co.
Dorn Landing-Lake Thurmond-10 a.m. to 12 noon-McCormick Co.
South Cove Park-Lake Keowee-10 a.m. to 12 noon-Oconee Co.
Lake Wateree State Park Landing-Lake Wateree-10 a.m. to 12 noon-Kershaw Co.
Easterling Landing-Lake Robinson-9 a.m. to 12 noon-Darlington Co.
Billy Dreher Island-Lake Murray-10 a.m. to 12 noon-Newberry Co.
Lake Murray Dam-Lake Murray-10 a.m. to 12 noon-Lexington Co.
Alex Harvin-Lake Marion-10 a.m. to 12 noon-Clarendon Co. The New Peach Tree Landing-ICW at Socastee-10 a.m. to 12 noon-Horry Co. Folly Landing-Folly River-9 a.m. to 12 noon-Charleston Co.
County Farm Landing (Leed)-Ashley River-9 a.m. to 12 noon-Charleston Co.
Remley’s Point Landing-Wando River-9 a.m. to 12 noon-Charleston Co.
Wappoo Cut Landing-ICW south of Charleston Harbor-9 a.m. to 12 noon-Charleston Co. Lemon Island Landing (Edgar Glenn)-Chechesse River-10 a.m. to 12 noon-Beaufort Co.
River Forks Boat Ramp-Lake Hartwell-2 p.m. to 4 p.m.-Anderson Co.
Galivants Ferry Landing-Little Pee Dee-3 p.m. to 5 p.m.-Marion Co.
Murrells Inlet Landing-Murrells Inlet/Atlantic Ocean-10 a.m. to 12 noon-Georgetown Co.
Greenwood State Park-Lake Greenwood-2 p.m. to 4 p.m.-Greenwood Co.
Main Ramp-Lake Bowen-2 p.m. to 4 p.m.-Spartanburg Co.
Parksville Boat Landing-Lake Thurmond-10 a.m. to 12 noon-McCormick Co.
Gap Hill Landing-Lake Keowee-10 a.m. to 12 noon-Pickens Co.
Ebenezer Park Landing-Lake Wylie-12 noon to 2 p.m.-York Co.
Lake Wateree Clearwater Cove Landing-10 a.m. to 12 noon-Kershaw Co.
One Response to "DNR Courtesy Boating Inspections Set for Memorial Day Weekend"